He looks like a young Benicio Del Toro. His character is portrayed as a mild vigilante. His character bites the ear off a nefarious bad guy. Finally, his rattled persona comes off as a present day Philip Marlowe type. So OK, I'm talking about Karl Urban and he stars in 2018's Bent (my latest review). 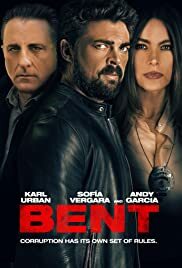 Urban, who's been absent from appearing in an actual movie theater these days, holds his own in Bent as tainted cop Danny Gallagher. Gallagher, with loaned gun and morality on his mind, comes back after serving three years in prison for showing up at a failed drug bust and accidentally killing a fellow peace officer. He gets out and tries to solve a murder mystery. Said murder involves a woman whose car blows up after she unknowingly turns the keys (ouch). Anyway, Bent has flashbacks, tough guy speak, a generous use of the word "scumbag", lots of people puffing cigarettes, and a winding narrative. You may need multiple viewings to get the full gist of it (I know I might). Still, Bent is directed with intrigue and tantalizing valor by Bobby Moresco (he's the co-writer of 2005's Oscar-winning Crash). Moresco shoots Bent primarily with a daytime noir setting in steamy (and sometimes rainy) Louisiana. His film is part Hitchcockian, part Usual Suspects, and has a twisty, non-traditional ending that's well staged. Sure his Bent contains wooden, cue card acting by co-star Sofia Vergara. 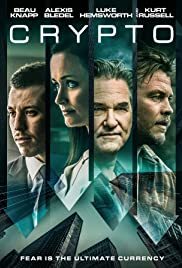 And yes, his film gets its title from another co-star in Andy Garcia (Garcia says the word "bent" 5-6 times throughout and it's kinda annoying). Nevertheless, Moresco takes what could have been a direct-to-video turd and polishes it to pristine silver. In truth, Bent reminded of John McTiernan circa 2003 (the military flick Basic is what I'm referring to). Bent, with its sense of alienation and its statue as glossed enigma, is anything but "straight-lined". Rating: 3 stars.